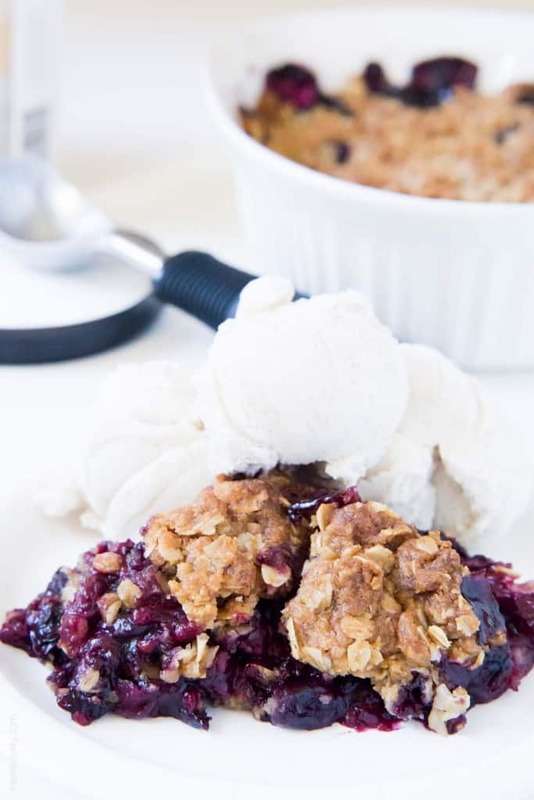 The easiest triple berry crumble, made with frozen fruit! 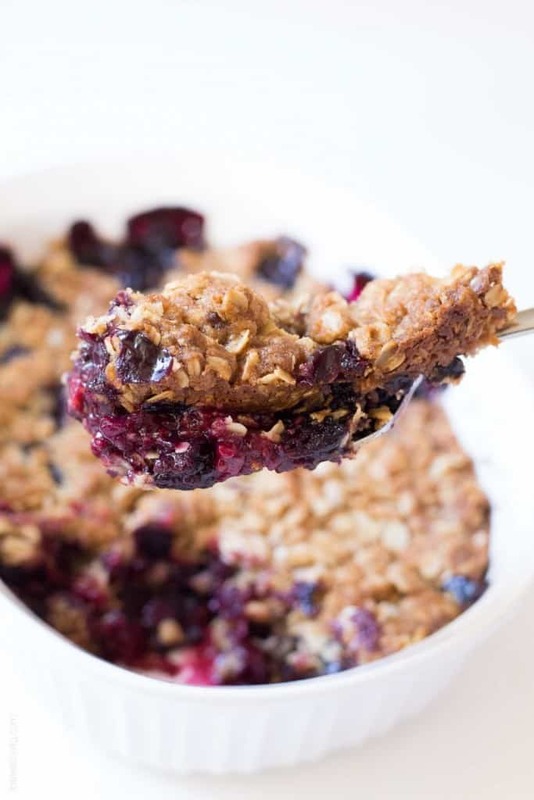 Thickened frozen berries topped with an oat crumble topping. Ready in 10 minutes! If you’re like me, you crave perfect spring berries all year long. 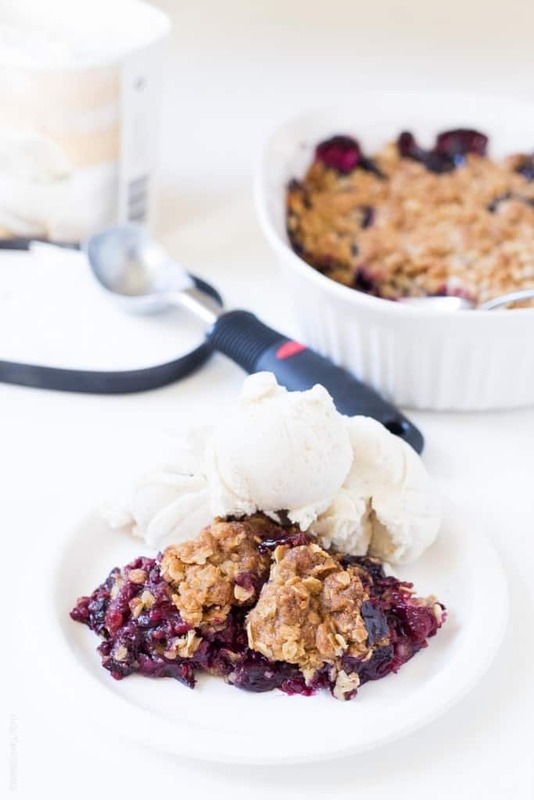 Thanks to this frozen berry crumble dessert, I can enjoy fresh berry desserts any time! Frozen fruit is best because it is frozen when it is at peak freshness. It has tons more flavor and nutrients. Plus, frozen organic fruit is much cheaper than fresh. Win win! Since the berries are getting baked, it is perfect to use frozen berries. They’re going to get all soft and mushy anyway. Even better? You can cook it with the berries frozen! No need to thaw them. 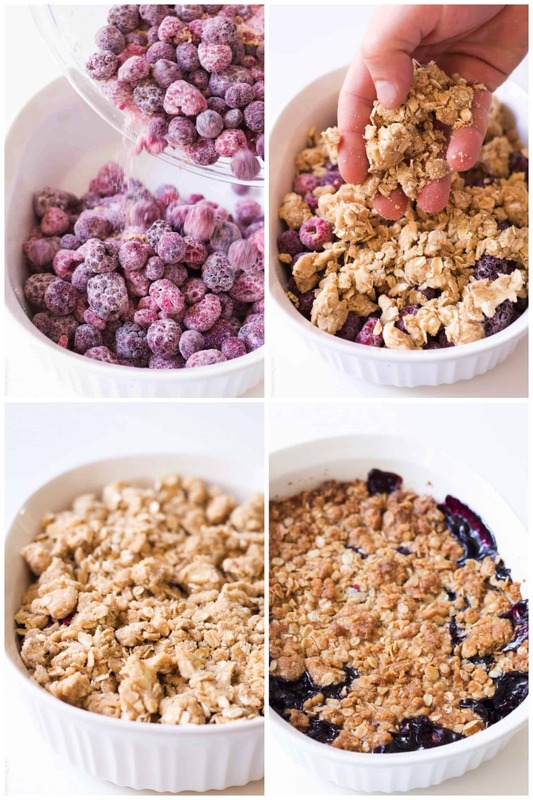 You can have this frozen berry crumble prepped and in the oven in less than 10 minutes. Love that! To thicken the berries I add in some flour, along with a little sugar for added sweetness and lemon zest for added brightness. The real star is the oat crumble topping. Crunchy and toasty oatmeal mixed with butter , flour and sugar. It is amazing. Top this frozen fruit crumble with some ice cream, and you’ve got the easiest and most amazing dessert to serve to guests or your family! In a mixing bowl, make the berry filling by combining all ingredients and tossing to combine. Set aside. In a separate mixing bowl, make the oat crumble by combining all ingredients, then use your fingers to pinch the butter and incorporate with the dry ingredients. Keep pinching and tossing together with your hands until evenly combined. You will be left with many pea sized pieces of butter mixed in with the oat mixture. Set aside. This same recipe also works for fresh fruit too! Just substitute the same amount of fresh berries for frozen. You can make this up to step 4, then cover tightly and freeze up to 3 months. Bake it fully frozen until golden and bubbling, about 1 hour also. This is an awesome and easy summer recipe! I love desserts like this! This looks so good. I have to admit for some reason crumbles make me think of summer being over. Weird right. Nevertheless it looks awesome. It’s been far too long since I enjoyed a good crumble! This looks awesome, and I’m sure it reheats well. Yum! I love hearing about all the antics in the ‘barn’ yard of the chickens and dogs… you’ve got a 24/7 party going on! Does Max have a fake chicken that will help curb his obsession? My little cousin dog, Lilly plays with her Goosie toy… we hope that feeds her desires without the real thing! 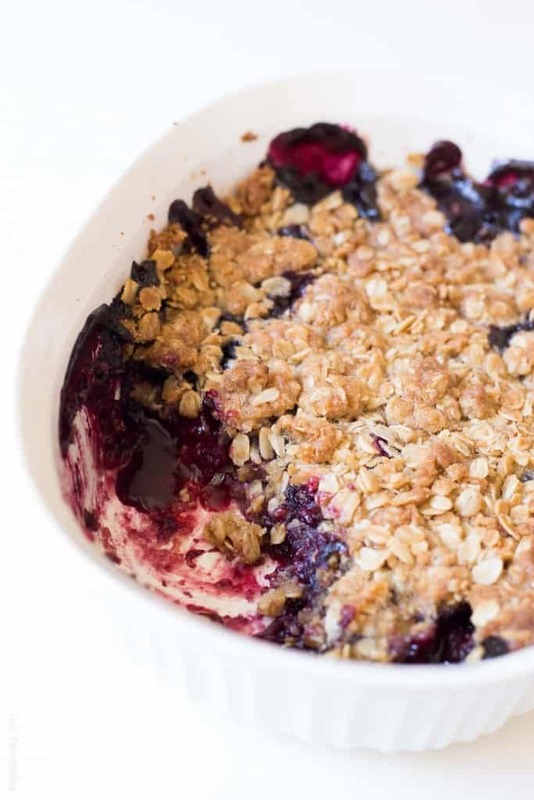 Oh this crumble is just gorgeous, Natalie! I love that you made it with frozen fruit, too. I always have some of that stocked in my fridge. I think I would eat all of this and not share with anyone! Love this! Haha, your animals sound like my kids! Just wait til there is a baby in the mix! Lol. I love using frozen fruit in the winter for a taste of summer. This crisp is perfect! 6 minutes??? I am totally into that. I am not a baker…so the easier the dessert the better! Love that this is made with frozen fruit. Pinned! Sounds like quite the zoo! It’s so funny how animals interact with one another, isn’t it? Oh, and your crumble looks amazing! The dogs and chickens are hilarious…pretty soon a sweet little baby’s cry is gonna be added to the madness ;-) And this crisp looks all sorts of delicious!! Max sounds hilarious!!! and I LOVE that you used frozen berries here! what a fabulous idea! Awww Max, what a cutie. I am so jealous your closest neighbor is 1/4 mile away! Mine’s about 1/4 foot away. Booo. Someday I want lots of land so we can get some chickies!! Your berry crumble looks soooo good! It’s definitely summery, but I love that you can get the frozen berries all year round so you can have a little summer pick-me-up in the middle of winter!! Such a funny story!! Don’t know how I missed this recipe, but glad I saw it now because I have lots of frozen berries ready to use and this recipe looks awesome! Hope you had a great weekend! It is hard to say good-bye to summer. But with temps here in the high 80s it doesn’t feel like I have to say good-bye yet. Which is awesome. So I totally need to grab some berries and get to making this. Looks amazing! WOW!! This looks amazing!!! …and it’s quick and easy?! Would’ve never guessed! It looks too good! Great recipe girl! Thanks for sharing! This looks amazing and I bet it would be great over some yogurt for breakfast! Slight variation I might try is to add some almonds in the crumble. 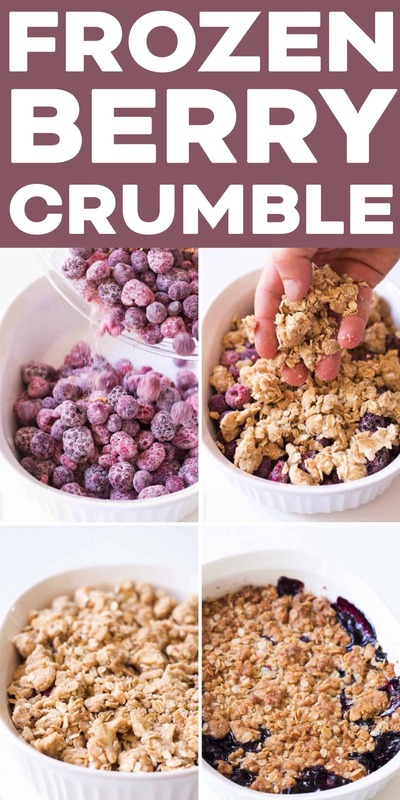 I think berry crumbles are my love language too! Over all really good recipe. I made it tonight out of ingredients I already had. Certainly fixed my pregnant pie and ice cream craving. Personally, I’ve never had an extremely sweet tooth so the oat topping was good but the sweetness definitely caught up with me a bit after a few bites. I ate it with ice cream so I will definitely cut the sugar and brown sugar in half next time. Definitely adding to my list of rotating staples. Excellent recipe. I’m so glad! Congratulations on your pregnancy Iliana! Total yum! I’ve made this recipe twice in the past week. I can’t get enough. It is so delicious and so easy to make. I even had some of it for breakfast one day….it’s got oatmeal in it, right? Can you replace the butter in this with coconut oil? Yes! I have! It works great. Use room temperature solid coconut oil, not melted. You’re going to love it! I have made this two weekends in a row. Cut the sugar a little and have had it for breakfast with yogurt to top. Its divine!Thank you for sharing! I love your idea of having it for breakfast! Basically just baked oatmeal with fruit, right? So glad you liked it! Hugs! So glad it turned out! It’s one of my favorite quick and delicious desserts that everyone loves! How can you substitute oatmeal I only have instant oatmeal? Instant oatmeal should work too! I just prefer regular oatmeal. It’s heartier and has a more toothsome bite. Would unsalted butter be ok to use? Looks like an awesome recipe! Yes! I may just add in a pinch of salt to the compensate. I’m so glad you liked it Amanda! It is one of my favorite desserts to make, mostly because it’s so easy. I love that everyone loved it too! This makes me so HAPPY! Made this recipe (halved) and my husband and I ate it all up right out of the oven. First reaction was we should have made the full recipe; second reaction was we’d have eaten that too, so good that we didn’t! Recipe’s already been placed in my ‘tried and true’ notebook, the highest honor a recipe can achieve in our home. Well this comment just made my DAY! Thank you so much Sara! Isn’t this crumble just too good? I’m so happy you and your husband liked it! And that this recipe made it into your “tried and true” notebook. What an honor! You’ve got me craving it again, I might just have to make it tonight with the frozen blueberries I got from Costco. Big hugs! Natalie this recipe sounds delicious. Would frozen peaches work as one of the triple berry choices? Yes! I’ve made this with frozen peaches and it is amazing! You can do it with all frozen peaches too. So good! This is my only crumble recipe now! I’ve made it loads of times with different frozen fruits and it’s delicious! I’m so glad you like it Faith! You just made my day! Thanks for taking the time to let me know you like my recipe. Means the world. Such a fantastic recipe, and I can attest that it’s great with gluten free 1:1 flour as well. Just perfect and so easy!! I’m so glad you liked it! And happy to hear gluten free 1:1 flour works too. Thanks for your nice comment, you made my day! This has become a family and company favorite! Thank you! Thank you so much Jeni! I love hearing that! Glad you and your family enjoy it! Am trying this recipe with Coconut and Almond flour, and Truvia blend, to cut back sugar and carbs for my family. The crumble part turned out beautifully.. we will see how it bakes! You’ll have to let me know how it turns out! I’ve been meaning to tweak this recipe to try and make it paleo/gf/refined sugar free!